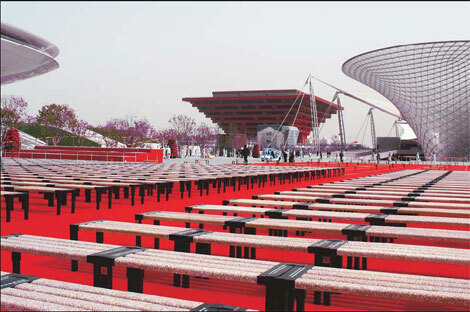 BEIJING - There were 2,000 specially made benches at the 2010 Shanghai World Expo Park last year, astonishingly all of them created from recycled milk cartons. Before the Expo, a total of 113 tons of milk cartons, which is equivalent to more than 10 million 250-milliliter containers, were collected by some 728,000 Shanghai citizens and transformed into the seats. Sweden-based packaging giant Tetra Pak was behind the recycling campaign. As the world's largest packaging company by sales, Tetra Pak has always attached great importance to environmental protection by following the company's "4Rs" principle - renewing, reducing, recycling, responsibly. In late May, Tetra Pak China joined hands with the China Packaging Federation and 11 dairy and beverage companies to officially launch the Packaging Recycling Alliance in Beijing. It is dedicated to boosting the recycling of packaging across the country. "Resources recycling and garbage reduction are major elements in China's 12th Five-Year Plan (2011-2015)," said Shi Wanpeng, president of the China Packaging Federation, adding that recycling of used packaging is one of the most effective ways to achieve the goal. "The Packaging Recycling Alliance will provide a platform for government, industry associations and related companies to work together to fulfill their social responsibility," he said. The current 11 alliance members include China Mengniu Dairy Co Ltd, the country's largest dairy company by market value, Inner Mongolia Yili Industrial Group Co Ltd, Bright Dairy and Food Co Ltd and Beijing Sanyuan Foods Co Ltd.
Carol Yang, vice-president of Tetra Pak China, said the company is expected to help double the global recycling rate of its used beverage cartons by 2020. "Achieving this goal means that about 100 billion used beverage cartons worldwide will be recycled in 2020 alone," she said. This would be carried out through active engagement in the entire recycling value chain, including technology development, efficient collection and sorting schemes and increased consumer awareness, she added. According to the company, 30 billion used Tetra Pak cartons were recycled around the world in 2010, diverting 473,000 tons of material away from landfills and providing valuable raw material for new products. After the founding of the Packaging Recycling Alliance, it launched its first campaign called 2011 Waste Sorting Educational Activity, in a bid to appeal for the public's participation in waste segregation and to popularize garbage-sorting practices. "Encouraging people to sort their garbage before it is collected is an effective way to reduce the amount of garbage by separating the recyclables and making better use of resources," said Yang. Since 2000, some of the first-tier cities in China, including Beijing, Shanghai and Guangzhou, have been calling on their residents to recycle garbage at the community level. On April 1, Guangzhou's local government released China's first regulation to make garbage sorting mandatory. According to the regulation, daily garbage should be sorted into four categories - recyclable garbage, kitchen garbage, harmful garbage and other types of garbage. The regulation imposes a fine of at least 50 yuan ($7.71) on individual violators and at least 500 yuan for every cubic meter from organizations that refuse to sort garbage. After adopting the system, the city aimed to ensure that at least 50 percent of its garbage was sorted before non-recyclable trash was disposed of in a landfill, according to Li Tinggui, director of the Guangzhou Administrative Committee of Urban management. The city is also expected to build up a comprehensive garbage sorting disposal system by 2012, Li said. However, Yang at Tetra Pak pointed out that for the vast majority of cities across the country, the more common situation is that only rubbish collectors and sanitation staff are responsible for waste segregation. "This campaign of garbage sorting initiated by the Packaging Recycling Alliance relies on the cooperation of each company and every citizen," said He Jiazhen, vice-director of the center for environmental education and communications with the Ministry of Environmental Protection. "If more people are sorting their garbage, more cartons will be collected and, accordingly, would definitely help the development of the carton recycling business," he added.